The weather’s warming up and long weekends are on the horizon. You know what that means…grill season! I know I say I love a lot of things, but I really, really love summer barbecues. I guess I’m being slightly deceptive though because this isn’t actually a grilling recipe. 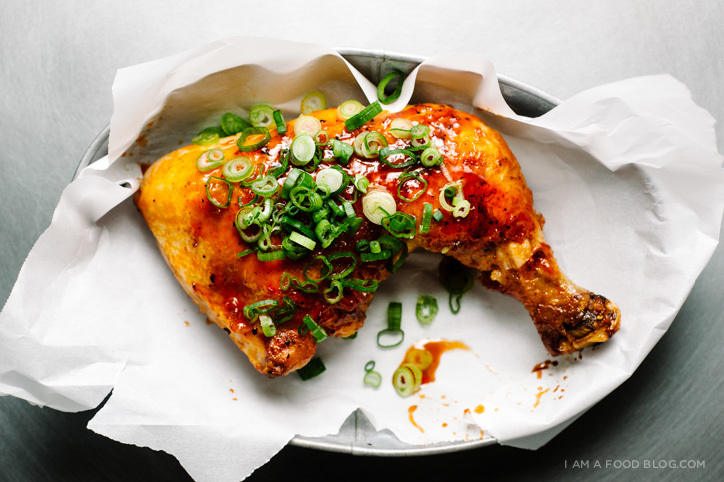 That’s not to say it can’t be for the grill though – the basic recipe is: cook your chicken, then glaze it with a sweet, spicy, tangy sriracha-honey-lime mix. Me (dancing around with the joy of barbecue in my veins): I LOVE barbecue. It’s the best thing ever! My dad (stoically eating a chicken drumstick): Silence. Me: Who even invented barbecue!? They’re are truly GENIUS! My dad (incredulous look): Caveman. Caveman invent barbecue. What?! 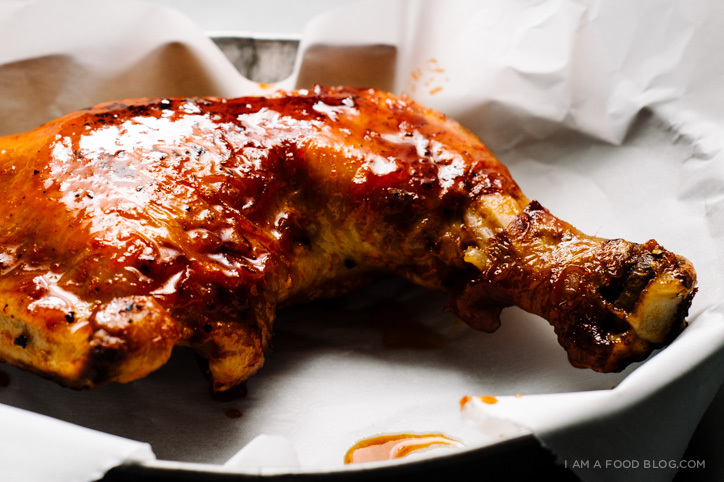 You go to university, you don’t know caveman invent barbecue? Me: Yeah I do! They’re not called cavemen, dad. They’re … um … hey, want some more chicken? And that is why humans like grilled things. Because cavemen did. 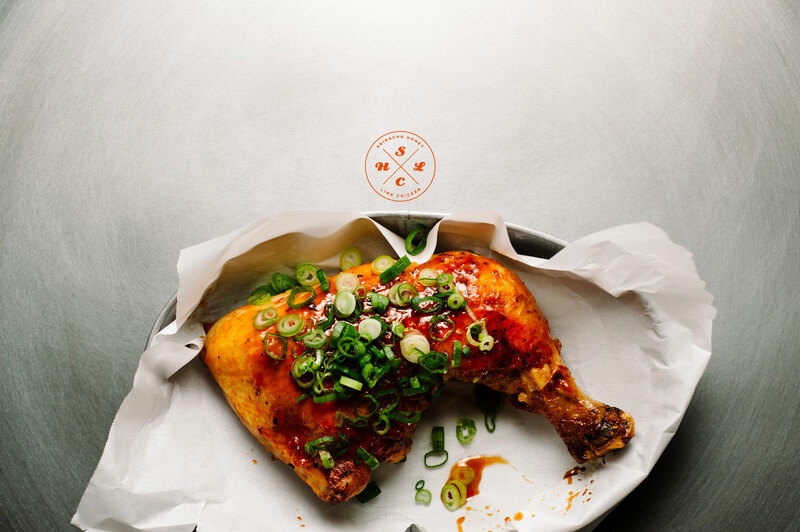 Cavemen aside, what is there not to like about this chicken?! It’s sweet, spicy, tangy and seriously finger licking good. I used whole legs because that’s what they had at the store, but you can go ahead and use whichever chicken part you like best. Really, the chicken is just a vehicle for the sauce! 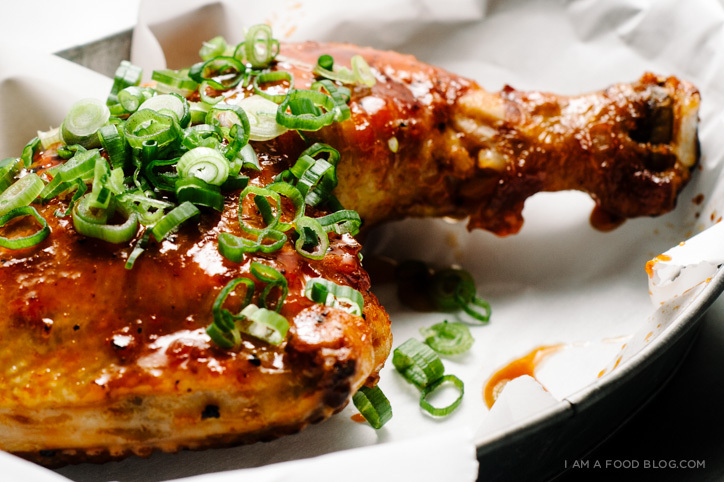 i am spicy, i am sweet: i am sriracha honey lime chicken! Pat your chicken dry and season with salt and pepper. Grill or pan fry the chicken on medium heat until the thighs are cooked through, 20-30 minutes, flipping as needed. 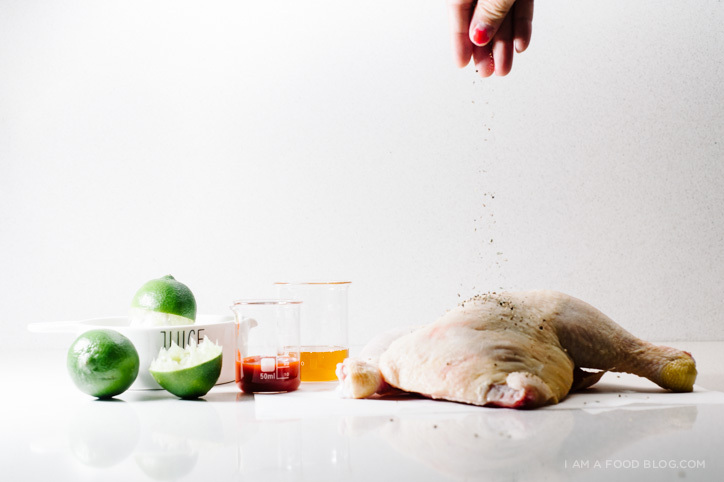 While the chicken is cooking, mix together the lime juice, honey and sriracha. If grilling, brush both sides of the chicken with the honey mixture and grill, flipping occasionally, until golden and sticky. If cooking on the stove top, add the honey mix to the pan and turn the heat up to medium high and reduce to a glossy sauce, spooning over the chicken. Enjoy immediately with sliced green onions on top. AHHHHH. 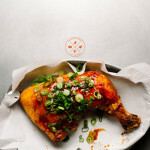 Sriracha + honey + lime + chicken!!! I want this so bad. The Whole Foods in my ‘hood has an awesome honey-lime chicken that I eat for dinner like, 4 out of the 7 days of the week. Honey and lime is seriously such a great combo, and I’m sure the sriracha just knocks it out of the park even more. I want this glaze! Tossed over wings. Tossed over everythang! Oh gosh, yes, on wings…I die. OMG so so so excited to make this this weekend. This chicken looks insane! Love the glaze so much. Beautiful work as always, Stephanie! Hi!! This looks incredible. Do you add the sauce after the chicken is completely cooked through? Or while it’s cooking on the pan? I add the sauce after the chicken is cooked through. It’s a little easier to tell if the chicken is cooked when it doesn’t have sauce on it. Hope that helps! sriracha honey and lime?? how have i never thought of this magical combination. YUM!! I can smell this emanating from my grill down stairs, MY GOD. I also used the left over lime bits for my beer. yay! so happy you had a chance to make it! and yes to the leftover lime bits for beer! Fan-frickin-tastic!!! This was a winner that will be repeated all summer long!! Thank you!! thank YOU for trying it out!! These were fantastic. I love srirachi and with the honey and lime it had the sweet and hot thing going for it. This was the first recipe i made of yours and now I’m going to buy your cookbook . Thanks. thanks joe!! that’s so awesome of you!! This recipe is simply stunning! Never taught about this combination. Must-try recipe. sriracha and the slow cooker sound like an awesome combo! So delicious!! But spicy too!! Made this last night, butchered a whole chicken, grilled all the pieces then tossed the chicken with the sauce (reduced on the stove) to coat. Its fantastic but some serious heat, maybe I didn’t have enough lime juice? Or it’s just really spicy, but regardless, would totally recommend! I’m using the leftover in tacos. The cave man thing was cute. Spicy and tangy. This very interesting. Thanks for the great recipes. I made this for dinner; it is simple to make, the ingredients are inexpensive/on hand, and most importantly – delicious! This will certainly be a “stand-by” for dinner! Hey, I’m a beginning cook, so I wanted to know more about how to pan-fry the chicken. Do you just cook it over the stove the whole time while turning it every once in a while? I’ve only ever roasted chicken, so this is new to me! yup, that’s exactly it! it you’re using a non-stick or cast iron pan you won’t need to add any oil as there’s quite a lot of fat on chicken thighs. 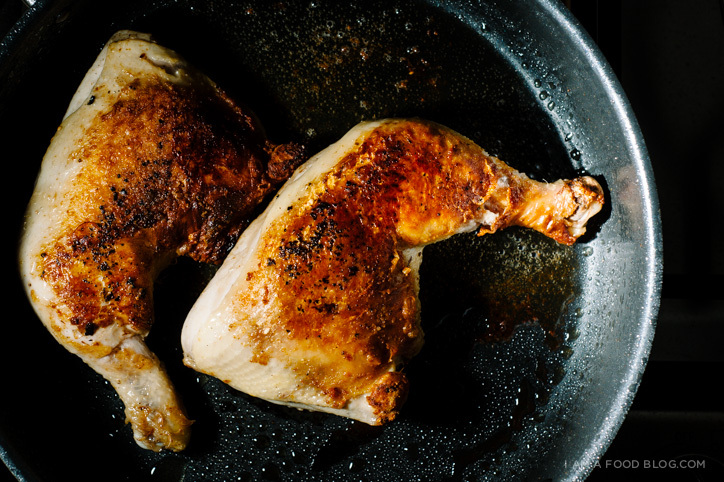 if it’s you’re first time, just be patient and cook on medium – that way your thighs won’t burn. if you’re more comfortable with roasting, you could also roast your chicken and then just add the sauce on top after it’s done roasting! Thank you for the quick response! I just discovered your blog, and I have to say, I am blown away by how gorgeous and innovative it is. Definitely the best-designed and best-photographed food blog I’ve seen! Easy gourmet indeed…I look forward to your cookbook. Hi! I just made this chicken and it was deliiiish! My boyfriend is freaking out over it. Thanks!! When you pan fry it do you use oil if so what kind and how much? I used a heavy-bottomed non stick pan with no oil – the thighs render out a lot of fat. We do the same thing adding a bit of sugar and sweet soy sauce. We haven’t tried it with the onions though, sounds really good! Sometimes we add fresh basil when serving (it may sounds a bit off, but it really combines great). This also GREAT in ribs !! !